Question: How do I keep the ends of grosgrain ribbon from fraying? 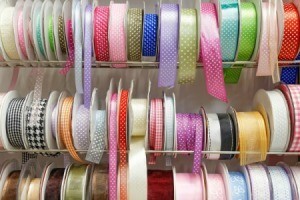 I am using grosgrain ribbon to decorate purses that I am making. To finish off my purse, I have grosgrain ribbon trailing off the purse (I know, hard to imagine). Anyway, to cut the ends, I use pinking shears to give that criss-cross look. The problem is, that it starts to unravel after awhile. Is there something that I can spray on it to stop it? Maybe something to "harden" it? I tried that liquid glue, but it was so gloppy and messy. Have you tried Fray Check? I don't know how well it would work on ribbon, but it works pretty well for me on fabric. Clear nail polish or a product called Fray Check from the craft or fabric store. I do know they have glue that you can spray on too. I have never tryed it but it is worth a try. You can get it at a auto parts store. I do know that there is a glue that you can spray on. I have never use it only in a car, but you can try that you can get it at a auto parts store. It is worth a try.